My wife and I have spent the last 13 years living in the wonderfully hospitable land of Turkey. After learning the Turkish language, we moved to a city of 400,000 people without a single Christian church, and as far as we knew, no followers of Jesus Christ. We wanted to share the good news of salvation and eternal life through Christ. Where would you begin in sharing the gospel with a Muslim friend? John 3:16 is a great summary of the gospel, but Muslims have been taught that associating a son with God is as blasphemous as imagining that He has a wife. I Corinthians 15:1-4 is also a good summary of the gospel, but Muslims have been taught that God rescued Jesus from being crucified and someone else was crucified instead. Besides, your Muslim friend may reason, God can do anything He wants. If He desires to forgive your sins, He will do it without any need for someone to suffer the penalty of your sins in your place (cf., Hebrews 9:22, Romans 3:25,26). It makes a lot of sense to begin at the beginning. The Bible begins by describing a good and powerful Creator who not only created the whole universe, but also created people to enjoy friendship with Him. The Bible is the wonderful story of how God has worked in history, even after Adam's rebellion broke that fellowship, to make it possible for people to know Him. The Book of Genesis lays the foundation for us to understand what God is like, why the human race has value despite the problems we have caused in the world, why there is so much evil in a world that a good God created, and how God planned and carried out His solution to the human race's deepest need. My wife and I appreciated our new Turkish neighbors and their hospitality, but longed for them to have a personal relationship with their Creator as we do. After developing friendships in the neighborhood, we were able to start a home study of the Bible—a book in which the Turks nominally believe, but know nothing of. We started where it made the most sense to start—in Genesis, at the beginning. We saw how almighty God created the world by His own power and word. This implies God's eternal nature and preexistence to all matter as well as His omnipotence, which are taught in detail in other passages of Scripture (John 1:1-3; Isaiah 40:25-28; Revelation 22:13). We saw that creation was originally very good. We saw that God created man in his own image with intellect, volition, emotions, creativity, and with both a capacity and a responsibility for making moral and spiritual choices. This stands in contrast to the Muslim idea of fate which minimizes individual responsibility. Then we saw how evil entered the world, what its necessary consequence was, and what God proposed to do about it by sending a Savior (Genesis 3:15). We saw why God instituted animal sacrifice, and later the Passover, and how they pictured the coming Savior. We looked at prophecies of this coming Messiah and how Jesus fulfilled them. By the end of the study, four of our Muslim friends had trusted in Christ as their Savior. Down through the years, as we and our co-workers have repeated and refined similar chronological Bible studies, we have seen that beginning in the Old Testament rather than in the New, actually helps people to understand the gospel. In 14 lessons we explain that the whole Bible is an intact story of God's involvement with people. It is not just a collection of unrelated nice stories or, worse yet, myths, but true and reliable history orchestrated by a purposeful, sovereign God who wants us to realize where we have come from and where we are going. Genesis shows us how God had regular communication with Adam and Eve (Genesis 1:26-3:8). Revelation ends with believers again enjoying God's daily presence (Revelation 21:1-4; 22:1-4). The middle of the story explains how the human race lost close friendship with their Creator, earned the wages of sin, and how God has provided a way for our forgiveness and the restoration of our relationship with Him (II Corinthians 6:18-21). Our Muslim neighbors understand from their Kurban Bayram (Sacrifice Holy day during which those that are able sacrifice an animal) that people are to demonstrate their generosity by keeping only one third of the meat from the sacrifice for themselves, and giving two-thirds away to their neighbors and to the poor. We explained from the Scriptures that from the very beginning God had warned Adam that the penalty for disobedience against God was to be death (Genesis 2:16,17; cf., Romans 6:23). It is interesting that God warned him that this death penalty would be immediate. Satan, in the form of the serpent (Revelations 20:2), denied that they would die at all. We saw that although they continued to live physically for many years, God's word was true (Titus 1:2). They did die immediately, because from God's perspective, spiritual realities are much more significant and important than merely physical. The root idea of death is separation. In physical death the spirit is separated from the body (James 2:26). But in spiritual death, which is far worse, people are separated from an intimate relationship with the Author of life, and their lives are filled with ruin and shame (Genesis 3:7-11; Ephesians 2:1-5). God gave people hope by instituting animal sacrifice in which the animal symbolically suffered the death penalty that the sinner deserved. The death of the sacrificial animal pictured salvation through the final sacrifice of the coming Messiah. The seriousness of man's rebellion against God is seen again in the stories of the Flood and the Tower of Babel. In our Turkish home Bible studies, my co-workers and I followed the clues through the Old Testament that described this coming Savior. Then when we came to the New Testament we looked at Jesus' unique life, death, and resurrection. Our friends in our home Bible study gradually began to understand why only Christ could ever save anyone from spiritual death through His victory over the grave.They had been taught by their Muslim teachers that each successive revelation or Scripture (the Torah of Moses, the Psalms of David, the Gospel of Jesus, and the Koran given to Muhammad) replaced the previous one and was more up-to-date. 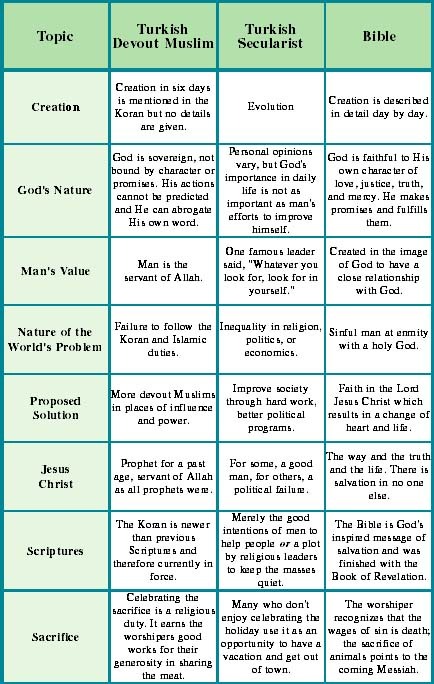 But by beginning in the Old Testament instead of in the New, they saw that the gospel truly is a continuous theme throughout the Bible from Genesis to Revelation, and that the Koran's message is totally different. Although Turkey is officially 99% Muslim, many Turks are nominal Muslims with a materialistic worldview, some even embracing Marxism. A chronological Bible study, as I described above, helps them to see God's purpose in creation, to see the sinful nature of man and the relevance of the Scriptures. Faith in Jesus Christ changes people from the inside out, making possible true social justice and compassion with no need for a revolution and a totalitarian state. One of our Turkish Christian brothers who attended one of these home Bible studies used to be a committed communist. He has realized that changing people's economic or political situation does not change their hearts. Marxists have failed to see that their whole understanding of history (evolution) and of the nature of man (basically good) is faulty and therefore cannot produce an ideal, harmonious society. The June 1998 issue of Acts & Facts discussed the creation conference which was held in Istanbul, Turkey, with ICR speakers. I attended the follow-up conference in Ankara with a Turkish friend whose wife has become a Christian, but who remains an atheist himself. He was impressed with Dr. Gish's evidence from the fossils that evolution is not scientific fact at all as he had thought. Some Turkish Christians also attended, including a friend saved through the home Bible studies I described, and were thrilled to get some teaching on the subject of scientific creationism. Good scientific teaching and translated materials on Biblical creationism are lacking in the budding Turkish church. Although religious Muslims believe in creation, there is a large segment of Turkish society that has been affected with the teachings of evolution and ideologies such as Marxism. It is my prayer that Christian creationist literature will be made available in Turkish to help dispel the notion that science has disproven the validity of faith in the Bible. After all, the Creator of the universe is the greatest and wisest scientist of all, and He has left us some of His personal notes in Scripture which we would do well to believe. May God pave the way for books to be published and teaching to be made available inTurkish, the language of Turkey, the land of Noah's Ark. In Turkey, various beliefs and religious attitudes may be encountered, but when it comes to explaining the gospel, it is always best to "begin at the beginning." * For safety reasons, the author desires to remain anonymous. Cite this article: anonymous. 1999. The Gospel of Creation in a Moslem Land. Acts & Facts. 28 (12).